Huaraz – The city hand santizer was invented for. We took the easy way from Huanchaco to Huaraz- a first class seat on a VIP bus (we’re still not sure who the VIPs were though). The seat laid down to a full 180° bed and it was comfortable enough to sleep for the nine-hour overnight ride through the mountains. The bus even had a stewardess who made sure we were well fed and satisfied with our service. We have roughed it plenty of times with transportation during our three months in South America, so we felt no remorse in splurging for the added convenience. Plus, the money we saved by not needing a hotel gave us even more reason to ride in style. Once we got off the bus, we realized it was the first time that we had taken overnight transportation and actually felt rested. We quickly put VIP busing on our list of experiences to repeat. Once outside the terminal and past the people trying to convince us to go here or there, we made our way to the hostel. As we were walking, we started to notice that something was different about this town. Garbage was strewn everywhere, the streets were some sad combination of dirt and ripped up concrete, and cars honked at everything that moved (and even some things that didn’t). We even were “lucky” enough to witness men, women, and children taking care of nature’s call seemingly wherever and whenever it called. Throughout all of our travels around the world, we have been to quite a few cities, but we both agree that this one felt the dirtiest. It was definitely a place to wear your shoes and not your flip flops. We put the city’s grime past us to enjoy the surrounding area. 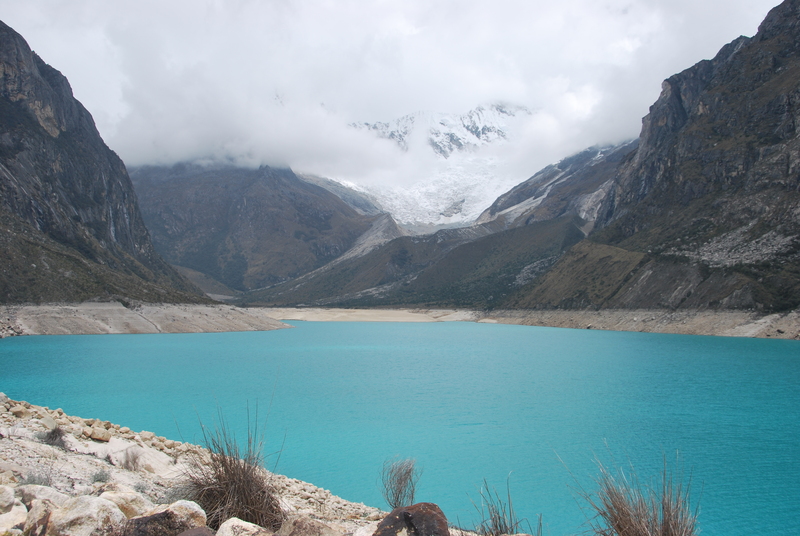 Huaraz is located in the Cordillera Mountains, which is the second tallest mountain range in the world. The town is surrounded by many peaks over 20,000, but unfortunately, it was the off-season and there was fairly consistent cloud cover hanging out around 17,000 feet, so were rarely caught glimpses of the massive mountains. 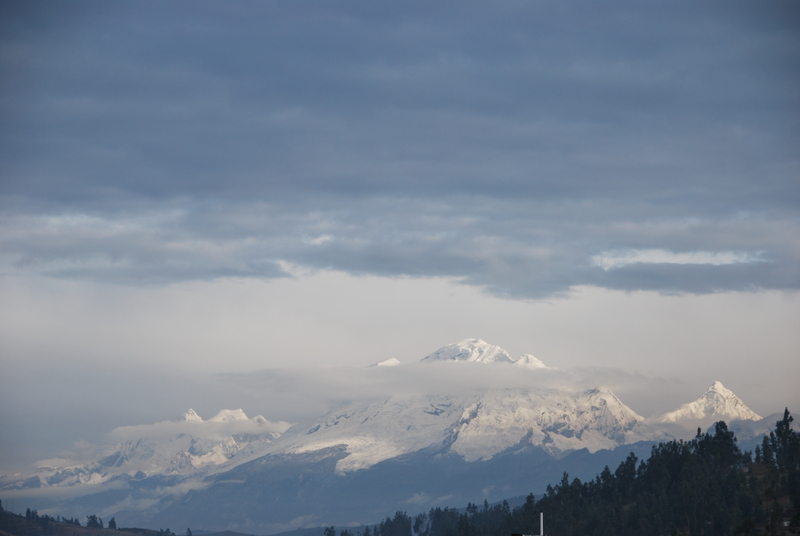 One morning, we were lucky enough to catch an almost full view of Huascaran, Peru’s tallest peak. 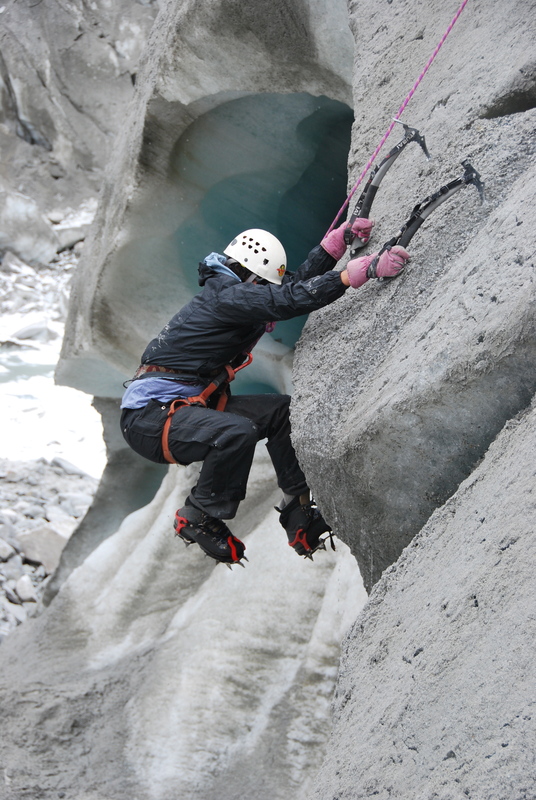 Huaraz is full of different outdoor activities, ranging from summiting mega mountains to ice climbing. Kristen has always wanted to try ice climbing, so for her 30th birthday present we arranged a trip to a glacier. We boarded a rickety old van and bounced up a mountain for three hours while enjoying the amazing landscape. Once we arrived, we had a short and “easy” 45 minute hike to the glacier. Easy is all relative- walking anywhere at almost 14,000 feet above sea level is never a simple walk in the park. 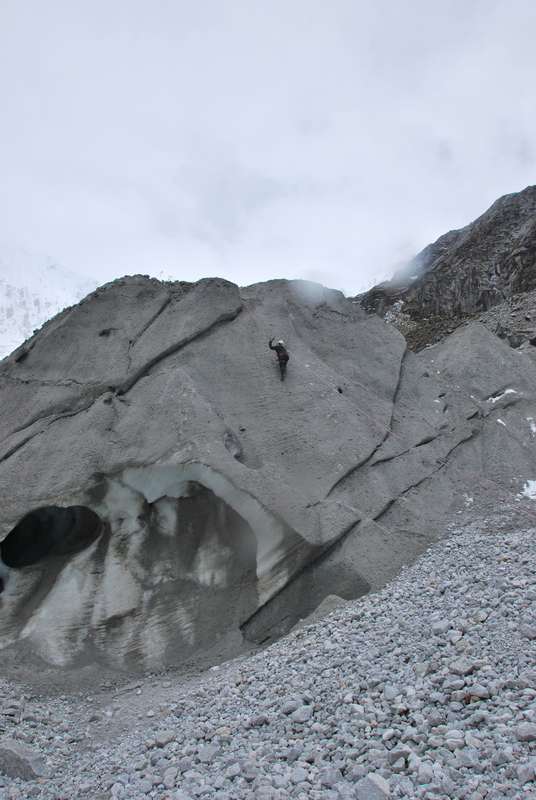 Once we arrived at the glacier, we caught our breath and took some pictures while our guide rigged the safety line and sorted out the gear. We donned a safety harness, crampons, and ice axes before scaling the vertical wall of ice. The ice was a bit dirty on this glacier but it was still quite cold. Seeing how this was Kristen’s birthday present, she was elected to climb first. Plus, this way, Joe would be able to pick up a few pointers before his turn arrived. Having successfully scaled the wall, she returned back to solid earth and Joe had his turn. The only pointer that Joe was able to take away from Kristen’s demonstration was the need for long legs, and we all know that was not likely to happen. We each took a couple of turns trying different routes in making the summit. It was a really interesting feeling to have to dig your axe and crampons into the ice, and to rely on them to keep you from falling. You could definitely feel the altitude, and seeing as this was a full body workout, once you reached the top, it felt like you might never be able to catch your breath again. With all our energy expended, we hiked back to the van just as the freezing rain began to fall. We were happy to reach the warm-ish van and even happier when we made it back to the city for hot showers and slightly thicker air. Wanting to see the better side of Huaraz, we hung out for a bit in the town square to take in the scenery, the local vibe, and to wander the local museum. The square was nice and clean, and Kristen couldn’t help herself from making a new friend. She tried to figure out a way to get her back home with us, but couldn’t come up with a good enough plan to sneak her past customs. The museum was interesting as it had many different artifacts from the area and even a few mummies. 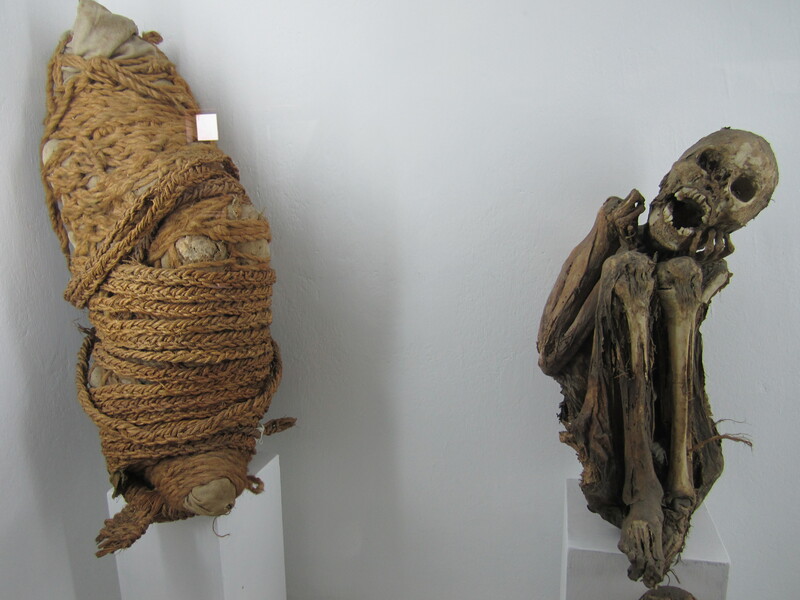 Not sure if the mummy was too excited about having his picture taken. 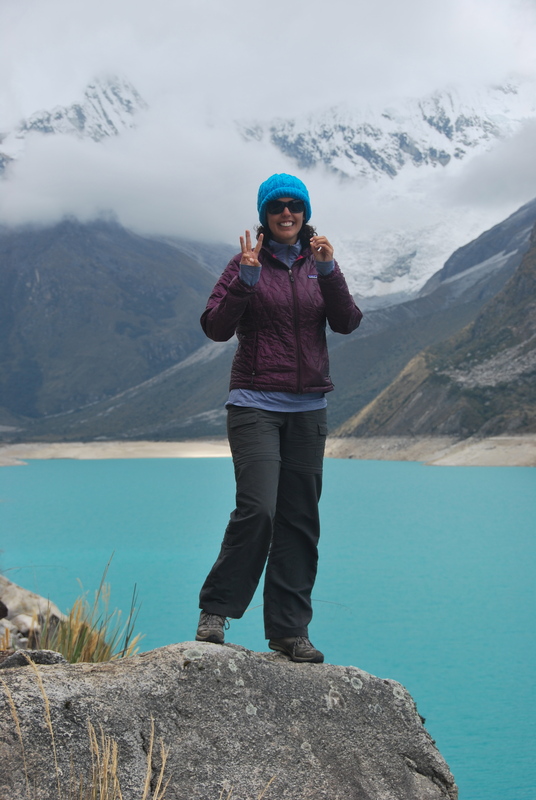 Our final full day in Huaraz was Kristen’s actual birthday, so we decided to hike to Laguna Paron. 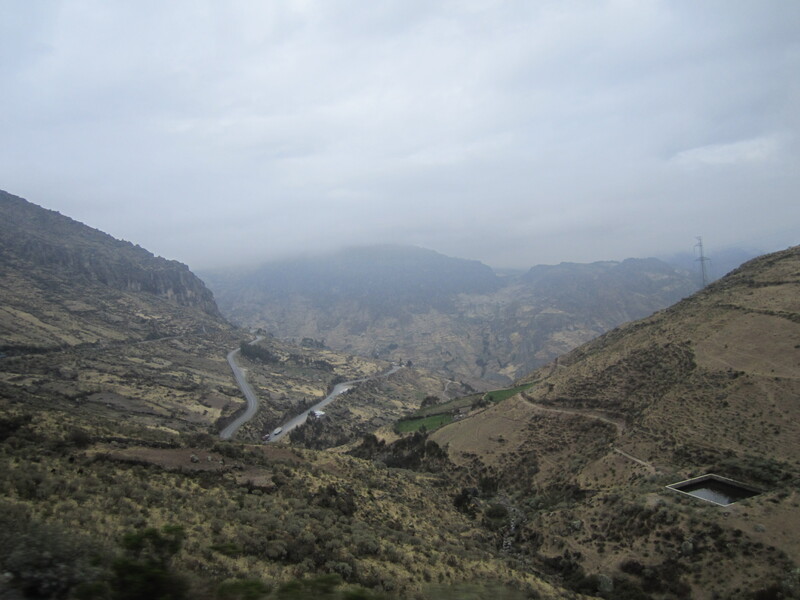 We traveled for an hour by bus to a nearby city and then hired a cab to take us up the mountain. It was another teeth rattling journey through a steep canyon, but the views were so awesome that it made the 1.5 hour ride fly by. Peru: another day, another curvy mountainous road. The ride alone would have been worth the trip, but when we got a glimpse of the lake’s crystal blue water, we were even more excited to begin our hike. This area is surrounded by amazing mountains with breathtaking peaks, or so we have been told. Again, the clouds hung around and limited our view, but we did get quick glances at the magnificent peaks. We had the whole lake to ourselves and we wandered around for two hours before we met up with our cab driver again. The trail was cut into the mountains at some points along the hike. While the actual town of Huaraz left something to be desired, the surrounding area more than made up for it. This place is a mountaineer’s dream with a never-ending list of hikes and mind-blowing peaks. 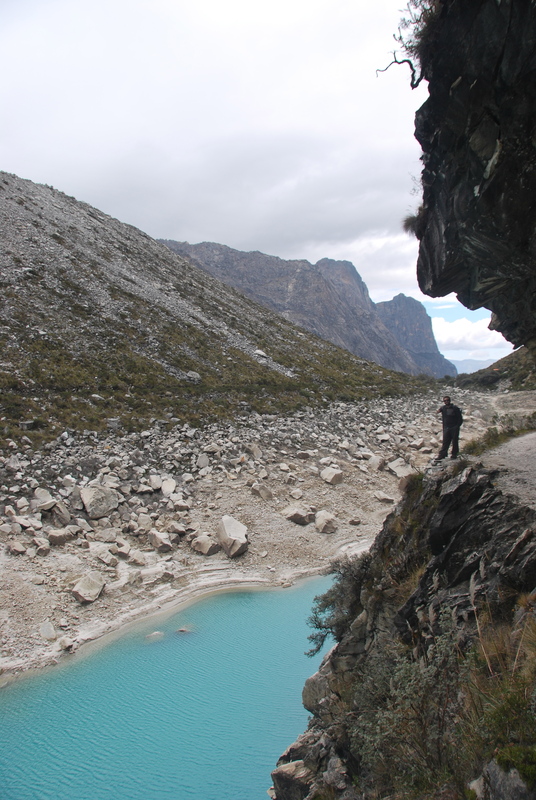 Had we been in Huaraz during the prime season, we would have definitely joined one of the many multiday hiking excursions. I guess that will have to wait until we can return some day. 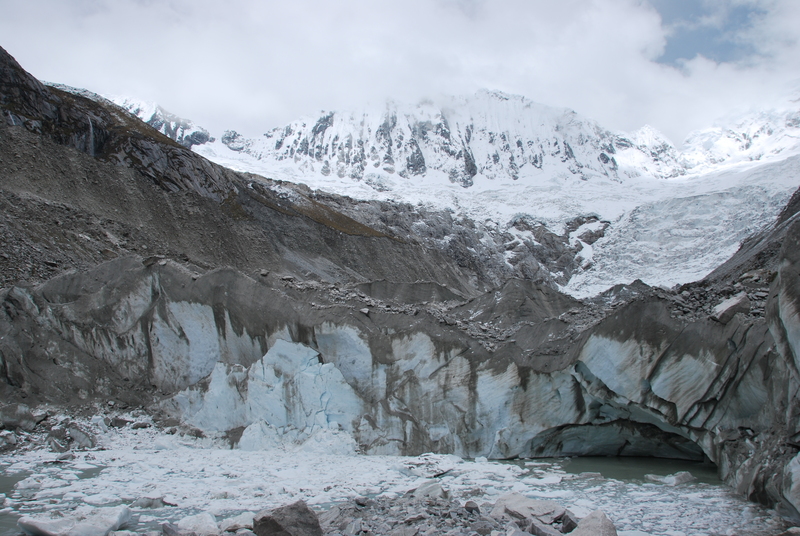 This entry was posted in Peru and tagged Huaraz, ice climbing, Paron. Bookmark the permalink. 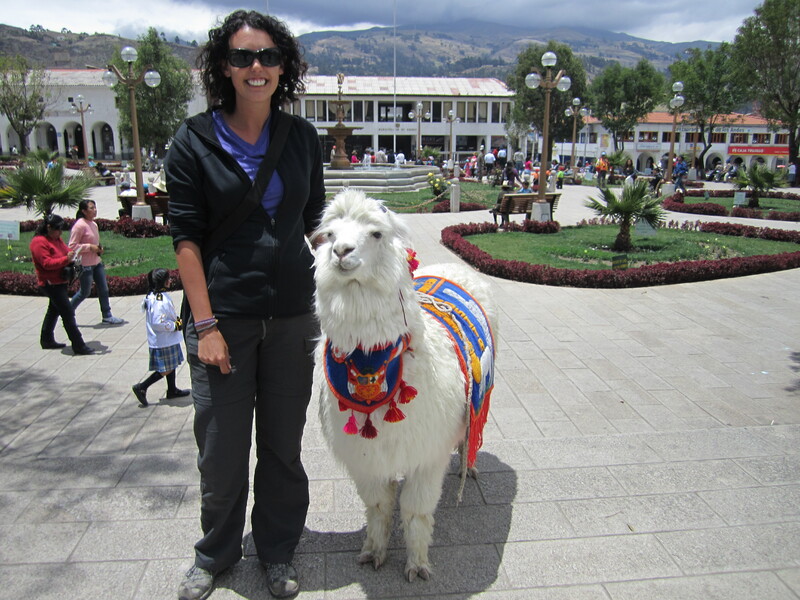 6 Responses to Huaraz – The city hand santizer was invented for. ROSITA…. OH MY GOSH. I don’t think I have ever been so jealous of you Kris. Missing you guys. Take care of Tee-tah. Now only 1 remains in Cali; Lord help us all. So happy I don’t see these pictures until AFTER you have survived the latest “adventure”. I shudder to think what crazy things you will be doing now that we have Teresa in the mix. By the way: Rosita “looks just like the baby”! Wow, that lake is gorgeous! As we traveled all over Peru (and South America), we found Huaraz to be the dirtiest city we encountered. I won’t go in to detail about some of the horrors we witnessed.